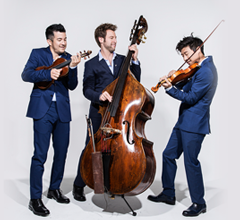 The Indianapolis Symphony Orchestra's second annual INfusion Music Festival will take place May 17–20, 2017. 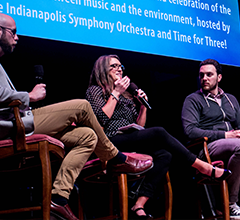 The expanded festival will celebrate the connection between music and the environment with three special concerts and an evening with some of Indianapolis’ leading environmental organizations. 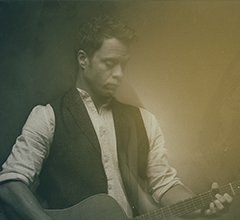 The festival will culminate with a performance by singer-songwriter Amos Lee with the ISO, making his Hilbert Circle Theatre debut! Tickets for all performances are on sale now. An evening of engaging short presentations from a wide range of local businesses and nonprofits who are committed to environmental awareness and outreach. Friday, May 19 at 9:00 p.m.
Time for Three, along with a special guest artist soon to be announced, will perform at the newly expanded HI-FI in Fountain Square. 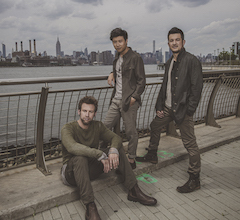 Saturday, May 20 at 8:00 p.m.
Amos Lee joins the ISO for his Hilbert Circle Theatre debut. Lee will perform songs from his new album, SPIRIT, an album which was inspired in part by his recent performances with orchestras and choirs. The program will also include Liquid Interface, a work by one of today's most acclaimed young composers, Mason Bates. Liquid Interface for Orchestra and Electronica is a piece inspired by water in its variety of forms, inhabiting an increasingly hotter world in each progressive movement.